The Sunny Air Walk Trainer is a trainer designed for no impact exercise. It is designed for a full body workout that delivered full body toning. This trainer is a great exercise option for people of all ages. It features an abdominal support that allows the user to feel secure and safe while they are using it. This trainer is simple and compact while still delivering a serious cardio workout. It features a computer display that keeps track of time, distance and calories burned during use. This trainer is recommended for users up to 220 lbs. This elliptical made it to our top picks for the Best Elliptical Machines of the year. The Air Walk Trainer is available for around $80 and is made and distributed by Sunny Health and Fitness. This distributor of health and fitness products has been headquartered in Los Angeles for the past 10 years and advertizes that they are committed to quality products and customer service. The Sunny Air Walk Trainer is a good fitness investment for the user looking for a no-impact full body workout. This is a good option for fitness equipment especially if leaving the home is not an option or a desire. It is made as a compact, easy to use piece of equipment. 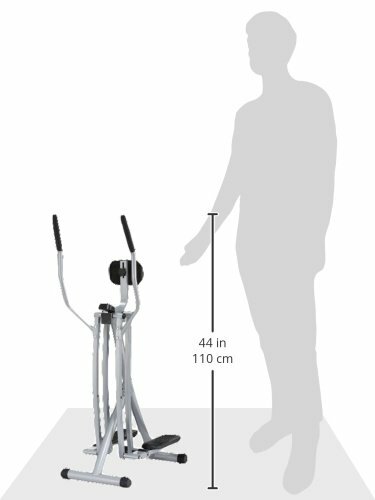 Users will enjoy the fact that it is easy to assemble and also easy to store in a small space since it is not a bulky trainer like those that might be found in a chain gym. It is light, yet sturdy and can easily be hidden away in a closet or corner when not in use. The construction allows for free, smooth, easy motion while working out. Since it is no-impact, users will find that this trainer provides a workout that is unlikely to aggravate the back, knees and other joints while still allowing a cardio workout. This is an attractive option for older users or those with physical impairments. The display screen allows the user to reach distance, time or calorie burned goals. Besides the no-impact, smooth workout, the Sunny Air Walk user will enjoy the many health benefits of this machine. The cardio exercise that it provides can improve the user’s quality of life and improve mobility. Stiff joints and extra weight can be just some of the problems solved by choosing an easy to use machine like this. With all the time that the average person spends sitting, trading just some of that time for a little exercise on this trainer will make a big difference. This trainer also comes at a very reasonable price. Although most users will enjoy the use of this equipment, there are some concerns. One concern is that the trainer does no have adjustable resistance. There is no adjustment available to make it easier or more difficult. Since it is set at a level that is user friendly, it is unlikely to be set at a level considered too hard, but may seem too easier for a user looking for a difficult, higher impact workout that other elliptical style or step machines may provide. Another possible issue is squeaking. If used for certain periods of time, some squeaking could occur. This could be resolved by adjusting equipment or position while using it. If the user is a very large person, this may not be the best choice. It has a weight limit of 220 lbs and seems to work best for those of shorter to average height. The trainer comes with an adjustable abdominal pad that can become uncomfortable if positioned incorrectly. For the consumer looking for a light, compact, easy-to-use piece of workout equipment, the Sunny Air Walk Trainer is a great choice. It gives the user an enjoyable aerobic workout without having to leave their home. This simple, sturdy trainer is ideal for people of all ages and fitness levels. It provides a chance to burn calories and get a full body cardio workout. This trainer is easy to store and does not take up much space in a room. It is considered to be a quiet machine and easy to assemble. The display helps you keep track of exercise goals and the leg motion makes the user feel like they are gliding on air. This trainer would a great choice for those limited in their fitness ability and comes at a very reasonable price.